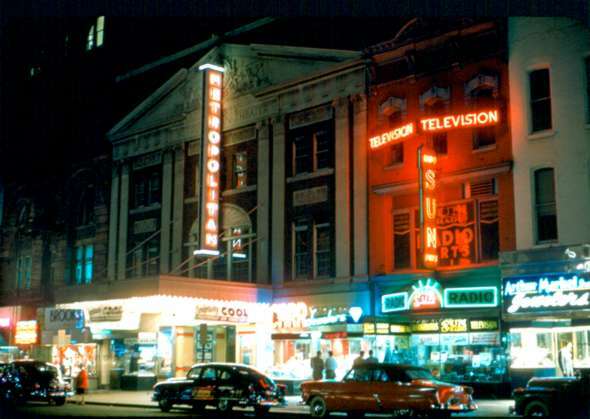 The Metropolitan Theater on F Street in the 1950s. This theater was located at 932 F Street NW in the downtown shopping district. Each newly released film played only to one downtown theater in each major city. The theaters were equipped with seating to show only one film at a time. Along with the feature film there was usually also a cartoon and a news reel. Premium prices were charged for admission at the downtown theaters. After the movie had been run for several weeks downtown then it became available at numerous suburban theaters. Again each theater was capable of showing only one film at a time. Admission prices were lower in the suburban theaters. Notice that the theater is advertising that it is air conditioned. Most of the office buildings and homes were not air conditioned and this was a good place to get cool during Washington's hot summers. Next - Glen Echo Maps.